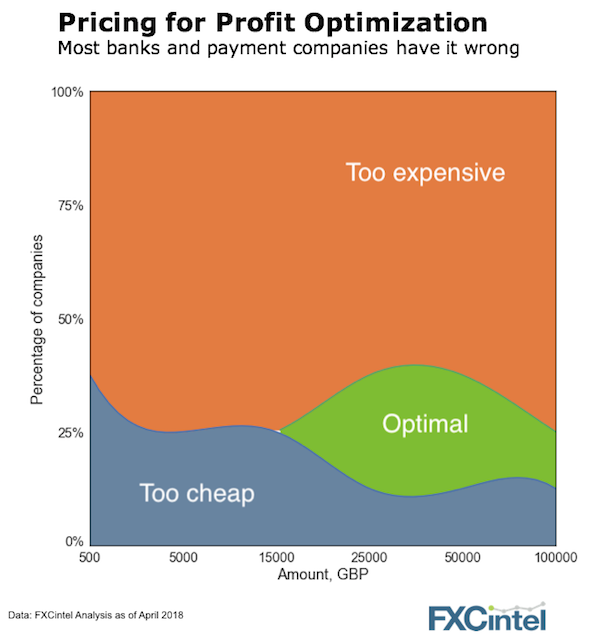 Pricing in Payments – Is Machine Learning the Solution? Pricing is the number one lever to grow your business and chances are you’ve got it wrong. Of the many topics we cover, pricing comes up again and again. We benchmark pricing, we predict pricing, we optimise pricing. However, the tools needed to price correctly, and the difficulties of changing pricing, mean few in the industry actually get it right and even less can adapt to change. Our own analysis of the market shown above suggests only a handful of players have correctly optimised for profit (e.g. Transferwise, Moneycorp & World First have at certain price points but not others). Most are too expensive, many are too cheap. Few are right – why is this? A/B testing of your own customer base doesn’t fairly reflect the pricing of the rest of the market, and doesn’t account for the biases in what types of customers may visit your site. The data needed to correctly analyse this is fiendishly hard to obtain, because of the biases mentioned above. The list above exists in addition to the challenge of deciding between the ease of communicating your pricing (transparency) and the flexibility to offer different customers different prices (profit/growth maximisation). 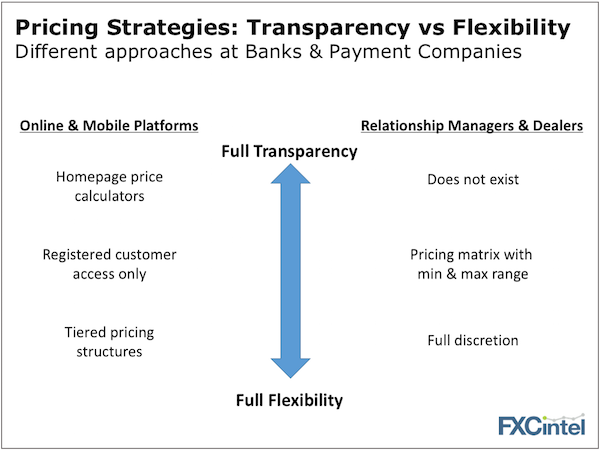 Banks and payment companies have a range of strategies, shown below. At this point you may be asking – is there a solution? What is machine learning? It is the science of getting computers to learn and replicate human reasoning, based on data from real-world interactions. Given the importance of pricing, and the problems we outlined above, we’ve spent a lot of time on this. In addition to our benchmarking analysis, we’ve developed our own machine learning methods to better understand the behaviour of international payment customers. This includes how different pricing options, branding, and reputation influence customer behaviour when making international money transfers. Our machine learning model “learns” to predict typical customer behaviour based on our own real world data. Once our model is fed with data, we can understand how different pricing options influence behaviour and customer on-boarding – and in turn optimise pricing for profit or acquisition. If you’d like to chat about pricing or machine learning and see it in action on our Portal, please reach out – we’d be happy to help.